November | 2008 | Copy-It-Right! In 2007 I initiated the Phil Morton Memorial Research Archive in the Film, Video & New Media department @ The School of the Art Institute of Chicago. This Archive contains Phil Morton‘s “personal video databank” which stretches across 30 years of Media Art Histories that are specific to the early Video Art and proto-New Media Art communities in Chicago. These communities were organized around shared ethical commitments and theorypractices, one of those being Phil Morton‘s COPY-IT-Right ethic. Schools such as The School of the Art Institute of Chicago and The University of Illinois at Chicago acted as incubators for the ideas and approaches that these communities shared. Students and faculty formed new departments and organizations that would develop into internationally recognized homes of artistic experimentation and technological development. During the most active period of the early 1970’s until the 1980’s the people whose developing paths crossed and became deeply interwoven, forming the closely knit fabric of these communities were people such as: Dan Sandin, Jane Veeder, Timothy Leary, Jamie Fenton, Larry Cuba, Ted Nelson, Tom DeFanti, Kate Horsfield, Lyn Blumenthal and Gene Youngblood. You may be familiar with some of those names, but the name Phil Morton may be unfamiliar to you. This is the situation that first began my interest in this project. I was unfamiliar with Phil Morton‘s name. I wanted to see his work and wondered how had this Media Art History gotten lost, forgotten or repressed? A few the reasons for this situation are that: Morton vehemently advocated for Free Culture and Open Source approaches to Media Art before such terms were in use. He experimented relentlessly with boundaries, ignoring as many distinctions between personal, professional, political, aesthetic and technological categories as possible. He immediately moved to include analog and digital computing into his artistic work and academic curriculum with very few antecedents to rely on or refer to. In doing so he purposefully and playfully explored what we would now refer to as New Media Art, an art that was radically open, remixed, collaborative and conversational. 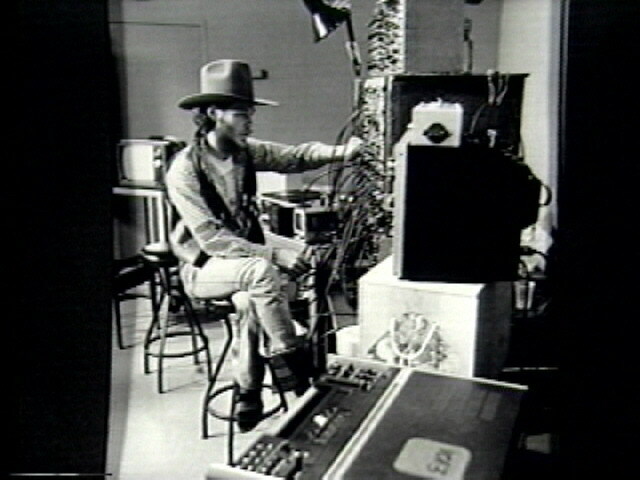 Phil Morton founded the Video Area in 1970 at The School of the Art Institute of Chicago. The Video Area was the first department in the United States to offer a BA and MFA degree in Video Art. Morton also founded The Video Data Bank, one of the world’s leading collections of Video Art. 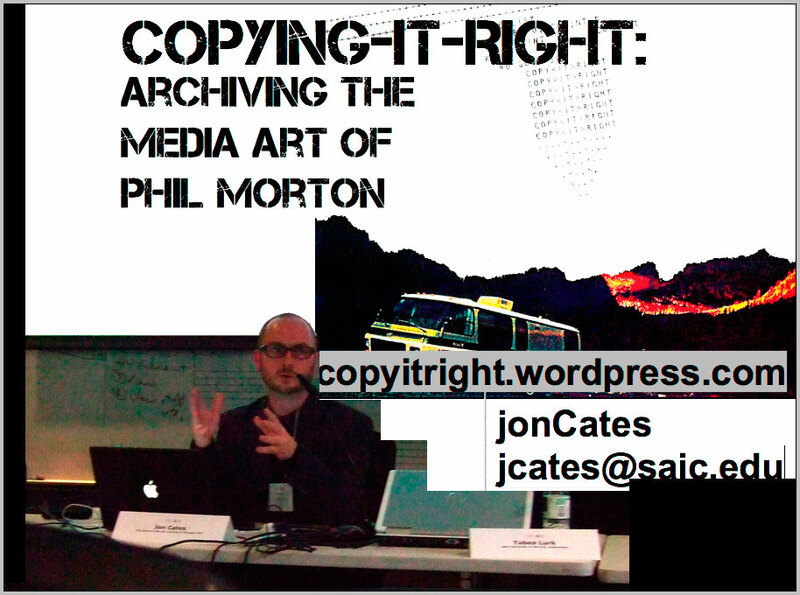 Morton developed the “COPY-IT-RIGHT” ethic, an anti-copyright approach to making and distributing Media Art. The Archive seeks to coordinate and share Morton’s Media Art work and associated research online in various formats under the COPY-IT-RIGHT license. 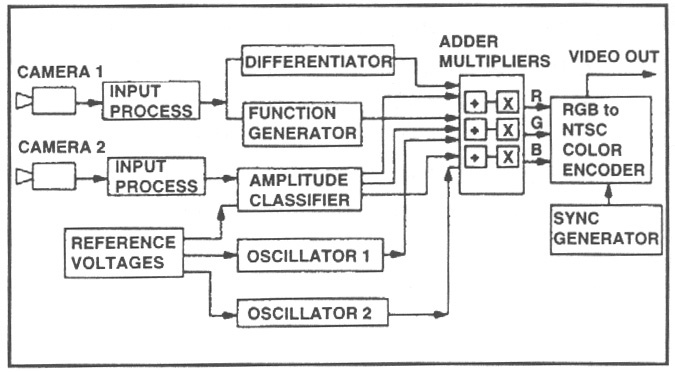 In 1973, Morton and Dan Sandin created plans for coping Sandin’s Image Processor, a patch-programmable analog computer optimized for video processing and synthesis. Morton and Sandin called this document The Distribution Religion. Sandin open sourced his Image Processor, releasing the Distribution Religion freely and incorporating any new modifications into the document. 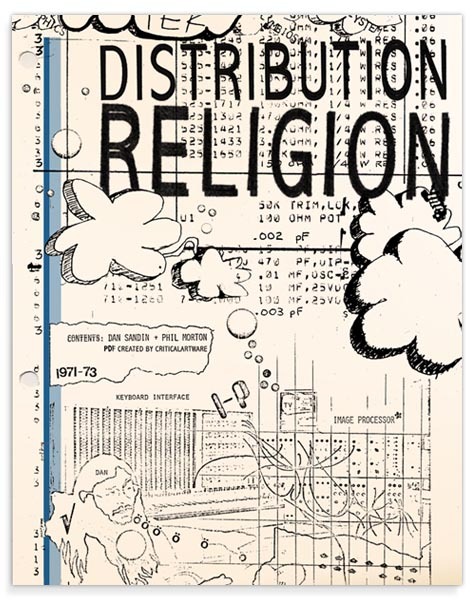 The Distribution Religion was also released under Morton’s COPY-IT-RIGHT ethic and as such presents an important predecessor to current Free and Open Source approaches to Media Art. Morton proudly referred to himself as the ‘first copier’ of Sandin’s Image Processor. The Sandin Image Processor offered artists unprecedented abilities to create, process and affect realtime video and audio, enabling performances that literally set the stage for current realtime audio-video New Media Art. The proto Open Source license developed by Sandin and Morton for The Distribution Religion, the technical plans for building copies of a Sandin Image Processor, anticipated many artists’ current approaches to Free and Open Source Software development, distribution methods and Do-It-Together (DIT) collaborations. This position as articulated by Morton in The Distribution Religion constitutes an important aspect of his COPY-IT-RIGHT ethic, namely, that copying is right, morally correct and good. In fact, for Sandin and Morton, copying is not only good it is necessary for their process, for their project, because it was conceived of (conceptually and technically) as expandable. The Sandin Image Processor is a modular system that is expandable or extendable via the creation of new modules, components and plugins developed by the community of co-developers who recreated and reimagined the possibilities of the system. Morton became known and recognized for his use of the Image Processor. Many of Mortons projects relied heavily on the Sandin Image Processor, as you can see on the Archive‘s blog. Currently 5 of his collaborative projects are downloadable on the Archive blog. Over 500 physical video tapes from the era of interest to my research (the early 1970’s and 1980’s) are in the Archive. The Archive consists of mostly 3/4 inch tape but also open reel and VHS. Additional tapes from the 1990’s and associated paper files, notes, documentation of process and photos are also in the Archive. Tapes from the era of interest to my primary research do not each individually constitute individual works of art but are rather process oriented themselves, consisting of raw materials, various versions, final edits and subsequent remixes. This quality of the Archive is what makes it particularly useful as a Research Archive in that it can be used to study the collaborative processes engaged in by the artists involved. This process can be viewed from initial acquisition of footage to various forms of Image Processing being run on the footage, to the processed footage being incorporated into an edited version, final edits and remixes. With Veeder’s first hand knowledge of the meaning of COPY-IT-RIGHT explained in the terms she uses, it is clear that COPY-IT-RIGHT is an anti-copyright approach coming from a counter-cultural position that preceded and anticipated cultural projects such as FOSS and unlike FOSS could also be called pro-piracy. But the ethic of COPY-IT-RIGHT emphasizes a moral imperative to freely and openly distribute creative works as widely as possible in the hostile environment of copyright and intellectual property regimes. I am using the phrase “intellectual property regimes” intentionally in this discussion to point towards the technosocial, cultural or artistic role of archives, that is if to put the issue in simplified terms an archive should function as a primarily protected intellectual property asset, a collection of such assets locked and gated away behind layers of copyright protection or if archives should function as and available resources that can allow materials to be further extended and engaged with in open and unforeseen ways. With the Phil Morton Archive my task is the facilitate the latter of the 2 simplified options. That is to say, the Archive most not become another indexed and cataloged set of materials in a library sciences style approach that would seal and stabilize the ownership of these media objects but rather that they must remain engaged in artistic dialogues that continue their ability to be used, reused and understood as processes of constant becoming. As Janice T Pilch states in her essay “Collision or Coexistence? Copyright Law in the Digital Environment” intellectual property regimes are most “often associated with efforts to wipe out music and film piracy” in terms of file sharing and copying of digital files online or in peer to peer networks. This is an important point for me in terms of the Phil Morton Archive, as his initial personal database, his COPY-IT-RIGHT ethic and his formation of the Video Data Bank were conceived of for the purpose of exactly this find of sharing, copying and exchange of Media Arts. These globals regimes, such as those defined in the United States and filtered through a great deal of corporate interest, began to be more firmly established in the 1980s through The General Agreement on Tariffs and Trade (The GATT), the 1990’s through the formation of the World Trade Organization and the WTO‘s Agreement on Trade-Related Aspects of Intellectual Property Rights (the TRIPS Agreement) and most recently the Digital Millennium Copyright Act (DMCA). DMCA is the most wide reaching and expansive of these laws and has recieved widespread criticism for it’s severity and general purpose applicability. Various forms of resistance to copyright have been identified by scholars such as Debora Jean Halbert in her 2005 book Resisting Intellectual Property. Halbert investigates a number of areas with a focus on the ways in which intellectual property regimes limit creativity and the exchange of information while increasing suspicion. Halbert’s work is very inspirational for me as is the work of Florian Cramer who has consistently stated in his writing and posts to nettime that the General Public License of the Free and Open Source Software movement can and should be applied to more that simply software. Among the most widely know alternatives to copyright is the Creative Commons. In 2002, Lawrence Lessig defined many of his ideas of Creative Commons in his “The Future of Ideas: The Fate of the Commons in a Connected World”. In a section entitled “Creativity in the Dark Ages” Lessig discusses creativity in the Dark Ages before the internet, which he defines as the “1970’s”. He claims to detail 2 forms of creativity, i.e. in “The Arts” and in “Commerce”. His claim of discussing “The Arts” is met only by his ability to very briefly outline the conditions of mainstream media, in particular through summarizing the developments of cable television in the United States. He does not engage Media Art History nor Video Art History through any discussion of any of the alternative artist-made media of the late 1960’s or 1970’s. This oversight puts Lessig at a disadvantage by limiting his ability to encounter work such as Morton’s COPY-IT-RIGHT which directly critiqued copyright prior to the popularity of Free and Open Source approaches or Creative Commons (CC). As a result Lessig imagines Internet technologies to present radically new abilities for exchange, sharing and collaborative or collective authoring of media. The physical and technologically mediated networks that Morton and his collaborators used to “bicycle” tapes and to copy them in order to further redistribute and remix these materials is overlooked by Lessig but provides an important foundation for current internet-based, digital and New Media Art related systems that setup alternative conditions of production, distribution, use, reuse, exhibition, etc. As Matteo Pasquinelli has written in “The Ideology of Free Culture and the Grammar of Sabotage” the Creative Commons initiative faces “a growing criticism that comes especially from the European media culture.” The European media culture critics cited by Pasquinelli include Florian Cramer, Anna Nimus, Martin Hardie and Geert Lovink. Among the critiques, Pasquinelli defines 2 positions. The first focuses on the fact that the producer-centered ethic of Creative Commons does not recognize or include a critical rethinking of the uses of media produced under a CC license (and therefore continues to contribute to a sociopolitical imbalance in the technosocial creation/construction of “producers” and “consumers”) while the second position highlights the related fact that CC is consistent with existing copyright laws and therefore does not provide a real alternative. Pasquinelli advocates instead for “a tactical notion of autonomous commons can be imagined to include new projects and tendencies against the hyper- celebrated Creative Commons.” To imagine an autonomous commons Pasquinelli refers to the concept of ‘Copyfarleft‘ by Dmytri Kleiner. Copyfarleft opposes systems of private control over the means of publication, distribution, promotion and media production. This opposition takes the form of a critique of ownership of material assets, recognising class issues and allowing workers to reclaim production. Copyfarleft issures that products such as Media Art works that are made under Copyfarleft remain free and as Pasquinelli states “can be used to make money only by those who do not exploit wage labour (like other workers or co-ops).” This explicitly ethical sociopolitical position connects back to COPY-IT-RIGHT as Morton’s position was also an “ethic” that opposed private property, ownership and economic exploitation on the basis of technologies. COPY-IT-RIGHT predates Free and Open Source, Creative Commons and Copyfarleft but as these 3 and other examples show, COPY-IT-RIGHT was a concept that anticipated these licensing models of digital media and materials. While COPY-IT-RIGHT and Morton’s individual and collaborative works were not born-digital, they could be said to have been “already-digital”. In the so-called “Dark Ages” of the 1970’s, Morton anticipated the upcoming personalization of desktop computing in the 1980’s and the digital video of the 1990’s. I have been and will continue to think and feel through these issues outloud rather than presenting definitive position statements. It is my sincere hope that this process can open a space for an ongoing conversation. Working in the field of Media Art Histories and New Media Art, both academically and artistically, I approach these issues from the perspective of a maker and identify with the work of Phil Morton. that sense of identification led me to conduct Media Art Historical research into his work, to literally rediscover a lost or forgotten Media Art History specific to Chicago but relevant and interconnected internationally.